We don't just make Maple Syrup. We CRAFT it. "Each year I purchase an ever-increasing quantity of Evans Farm syrup for my clients, customers, colleagues and friends. I've been an Evans customer since 1975." Preparation for sugaring season may start as early as January, stringing or repairing a network of pipelines that runs from from tree to tree throughout the sugar lots (groves of maple trees clustered together from decades of forestry management). As temperatures moderate in mid to late February, the tapping process may begin. We start by drilling a hole into the tree trunks, approximately 2-6 feet from the ground. We then drive in either a plastic spout (to connect to the pipeline collection system) or a metal spout (from which 12-16 quart buckets with covers are hung). The pipelines deliver the sap to storage tubs at the bottom of the sugar lots, or they may lead directly into the sugarhouse itself. Sap buckets are emptied by hand into gathering tanks hauled behind a tractor or truck, and transported to large stainless storage tanks at the sugarhouse. Each season our combination of buckets and tubing produces approximately 30,000 gallons of maple sap  dripping out of the 3000 individual spouts, one drop at a time. The best sap runs occur when the temperatures are low- to mid-20s (F) at night and low- to mid-40s during the day...the faster the warm up, the better the production of the run. 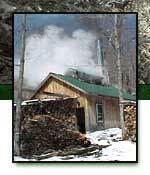 Maple syrup is produced by boiling the sap at 219 degrees Fahrenheit, evaporating much of the water. This evaporation process is what produces the tremendous amount of steam that can be seen billowing from sugarhouses each Spring. On average, it takes approximately 40 gallons of sap to produce a single gallon of maple syrup. At Evans Maple Farm, our evaporation is done over a wood-fired, airtight arch, with fans that burn the wood at a hotter temperature, increasing the efficiency. The fire in the arch is drawn through numerous flues in the back pan, aided by air drafts created by an overly tall chimney stack. Sap circulates around the vast boiling surfaces of these flues, on its way to the front pan  where the highest quality maple syrup is drawn off, strained and processed into various size containers.